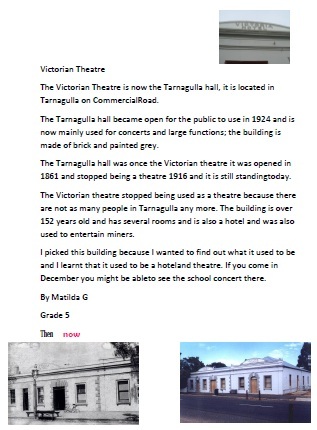 The following is an overview put together by Rosa Lockwood of the work that she has undertaken as part of her student teacher placement at the Tarnagulla Primary school in October, 2013. Rosa Lockwood is a pre-service teacher studying Primary Teaching at Latrobe University in Bendigo. Thanks to Rosa for the inspiration behind this work. Over the course of three weeks I had the pleasure of working with the students in the grade 4 -6 class at Tarnagulla Primary School. 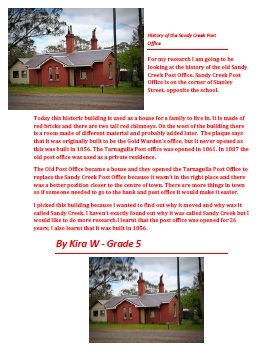 Through discussions with their teacher and principal, Leigh Mellberg and with his support and the help of other teachers at the school, Lorraine Douglas and Carol Offer, the idea of humanities unit focused on the History of Tarnagulla was developed. 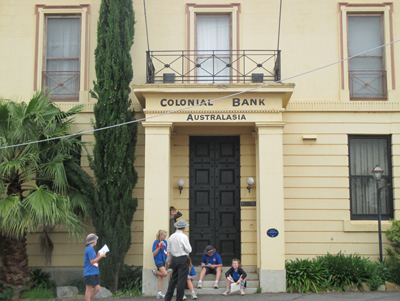 Starting with an introduction into key events in Australian history and their influence on the area, the students then completed a walk around Tarnagulla; recording notes and taking pictures of the historic buildings and features of the town. Using the information recorded during the walk the students were able to create their own maps of the town and identify a building of their choice that they wished to research further. 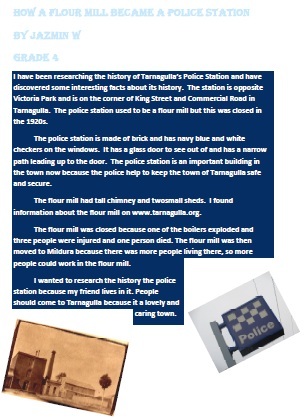 This website with its combination of primary and secondary sources and the plaques located around the town provided an excellent basis for the studentsâ€™ research. 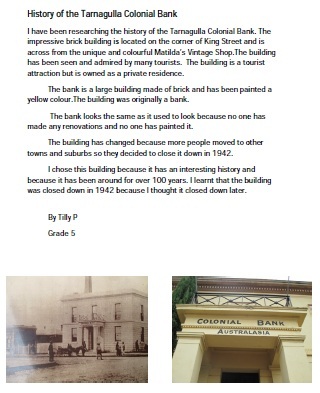 Then, drawing on the content covered over the series of lessons the students produced a descriptive writing piece, detailing the history of their chosen building and why they were interested by it. To conclude the unit we were privileged to welcome local history buff, Wendy Sutton, in to the class. 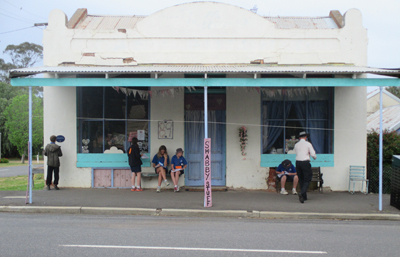 With her wealth of local knowledge, stories and pictures we were able to learn even more about the colourful history of town. 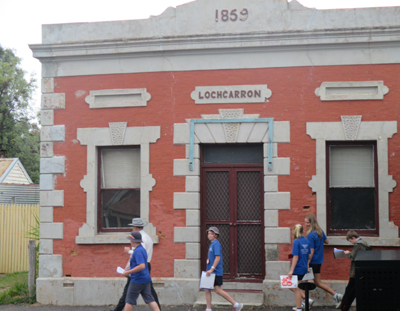 The studentsâ€™ curiosity had been sparked with rumours of jail breaks, explosions in the flour mill and mysterious fires and Wendy was able to answer all of their questions and provide us with a greater understanding of the changes that have occurred in the town. So thank you once again Wendy for a wonderful afternoon! 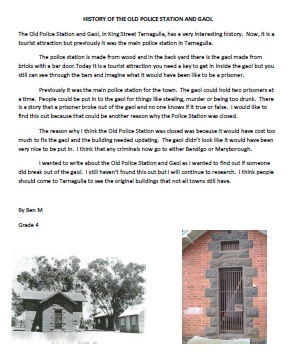 The intention of the unit was to use an investigation in to the history of the town as basis for several lessons, linking aspects from the history, geography and English areas of the curriculum. The objective of the lessons was to develop the studentsâ€™ knowledge of their local area, their research skills and application of geographical skills and language. The written pieces are the studentsâ€™ final assessment for the unit â€“ and I am incredibly proud of the work that they have all have achieved. As a teacher I was lucky to have such fantastic resources to work with, so thank you to all those that have contributed to the website, to Cameron for all of his support with this and the school for facilitating this project. Most importantly though, I would like to thank the students for their hard work, enthusiasm and for keeping me on my toes these past three weeks! 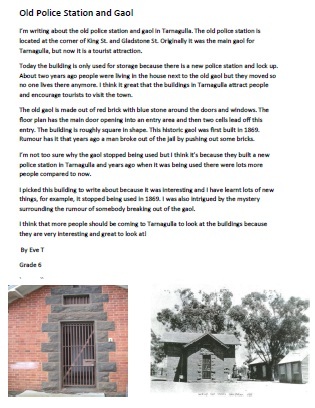 Hopefully you will enjoy reading the studentsâ€™ writing as much as we enjoyed working on it. 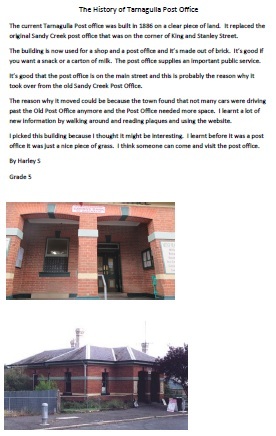 The following are photos of the children around the town doing their research. Finally, below you can view the great work that the students have created. Simply click on the image and the original work can be viewed in pdf format. 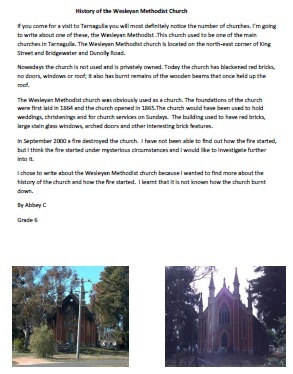 Links to the students work.